What do carnival clowns, aliens and retro Fisher Price toys have in common? Artist Kelly Grace of course! Kelly intertwines a subtle yet powerful sensation of nostalgia into each hand drawn and painted piece she creates. In her current practice, Kelly channels her unique childhood experiences through her love of old-style cinematography, costuming, and vintage toys and objects. Her main creative sources are often movie or television series she watches as a “palette cleanser” to wind down at the end of the day, with Twilight Zone, Mad Men, and Bewitched being her all time favourite shows. The title of Kelly's upcoming exhibition,“Between Light and Shadow”, is an excerpt from Rod Serling's monologue featured in the first season of the Twilight Zone in 1959. These inspirations make Kelly’s works so much more than just painting. She ties theatrics, costume design, film and painting into a single entity. When shooting her source photographs Kelly sets the scene by styling her models’ hair and outfits. Her costumes are carefully selected from second hand shops or made by hand, and her scenarios are infused with drama from a keen eye trained by a love of film. Kelly gives credit to the YouTube channel Lisa Freemont Street for teaching her how to perfect her 1950s hairstyles based on Grace Kelly’s character in the Alfred Hitchcock classic “Rear Window”. Kelly Grace, Date Night 81, mixed media on panel, 4"x6"
Well-known for her “Date Night”, “Fisher Price”, “Movie Night”, and “Viewmaster” collectible series that average 4”x 6” in size, Kelly has a much larger plan for her April showing (see photo gallery below). While visiting her studio in the East end of Toronto, I got to witness the beginnings of some of her largest works to date. One of her panels even reaches a massive 4 ft x 6 ft. 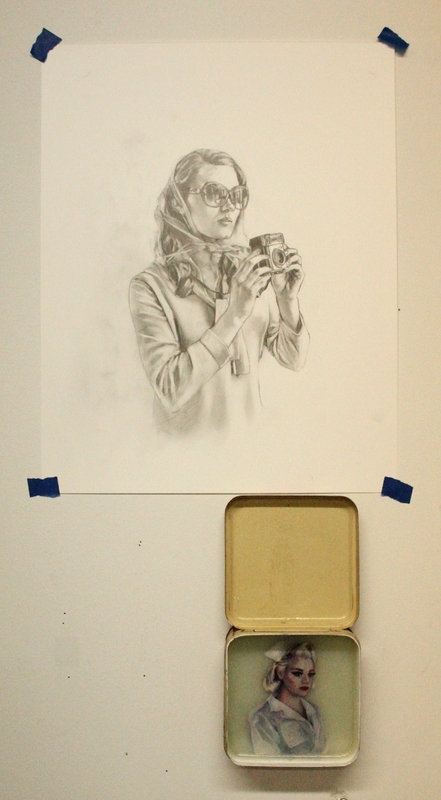 Since Kelly works on her pieces flat, it poses a whole new challenge to the artist. I suggested she may have to resort to suspending herself from the ceiling Mission Impossible-style. We’ll see if she takes my suggestion. She wouldn’t give away any more about her largest endeavor besides the fact that it will be a portrait of her and her husband, Shaun Downey, a painter in his own right. Kelly Grace, Records in Bed, mixed media, on panel, 5"x10"
Kelly Grace, Movie Night - ROM COM, mixed media on panel, 5"x10"
Not only are Kelly's works expanding in size, she is also bringing a whole new method into her practice. 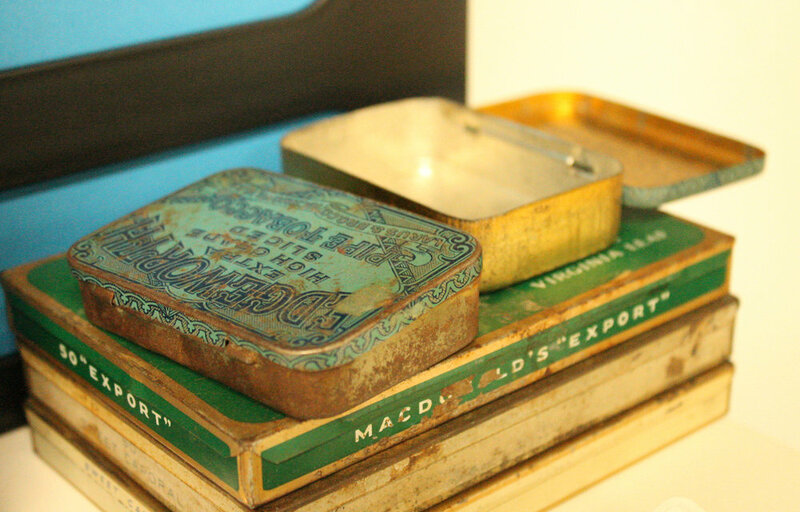 Using a layering process with acrylic paint, Kelly revitalizes antique cigarette tins into pocket size works of art. Playing on the branding of each tin, she decides what story to depict inside. Kelly expressed her gratitude towards the friends who took the time to comb through countless antique shops to help her build her charming collection. However, she has yet to find her much sought after Black Cat tin. I know I’ll be keeping my eye out for one to send her way! Kelly in her Toronto studio, enjoying a "Kelly Cappuccino"
Kelly’s subject matter is inspired by her family’s artistic history. Kelly’s grandfather was a clown and both her grandparents worked as puppeteers in the 1950s California carnival circuit. This creative vein kept running through her father and mother. Kelly recalls her youth, watching her parents spend late nights building set designs for plays at a local church in Toronto. Kelly decided to follow her dream of a life in the arts, attending Sheridian College for a degree in Illustration. Kelly recalls her first few years of her degree as a struggle, often feeling dissatisfied with the projects she was turning out. Until a professor assigned a project on phobias. That’s when her history with clowns brought her mojo back. Kelly chose Coulrophobia, the fear of clowns, and painted the piece that would terrify her professor and start her current method of working in motion. The clown painting that set Kelly in the direction of her current method of working. Work in progress shot at Kelly Grace's studio in Toronto's East end. Kelly Grace, Pin Up 1, 5"x10"
Kelly continued to refine her process of illustrating, transfer and painting into the works we know and love today. Whether you’re a collector or new fan be sure to make it out to her show from April 12th - April 30th. Kelly describes her new works as "bigger and better than any Kelly Grace show in the past". If you’d like to meet Kelly in person, she’ll be gracing us with her presence for a celebration of the show April 22nd from 5-7 pm at our own Wall Space Gallery in Westboro. You can follow Kelly’s preparation for her solo show on her Instagram and new website: http://www.kellygracefineart.com/. Keep an eye out for Kelly's feature in Ottawa Magazine's online arts and culture section by Paul Gessel!